Oriental Fruit Moth (OFM): The flight captures really jumped this past week, especially in northern counties where some farms are seeing over 100 moths per trap. This is a reference point for 2 factors: First, OFM treatments should be ongoing during this time – see table below; and the first generation flight is usually the highest, and the most important to control. For those growers using the diamide insecticides (Altacor, Belt, Voliam mixes, and Tourismo), the timing for the second application in southern counties is now. Insecticides are required according to the degree day timings in the table below. These timings should be used for most farms. If you have high insect pressure, then additional sprays may be needed. If your trap counts exceed 6-8 males per trap 7 to 10 days after the second spray, then additional controls may be required. Thrips: Western flower thrips and flower thrips are easily found in northern county peach and nectarine blocks. Remember, these were in southern orchards 7-10 days ago. Delegate and Lannate are the 2 best materials to use. Delegate does not control PC, and Lannate is weak on PC. Therefore you must use a combination if treating for thrips. Tufted Apple Budmoth (TABM): The first tufted apple budmoth adults were caught on 5/12, therefore we are setting the Biofix to start the degree day model as of that date. More on this over the next couple of weeks. Plum Curculio (PC): Fresh injury was seen on plums and apples this week. Mid–to late May is usually peak PC activity. This is an edge related pest that normally disperses from alternate hosts in the surrounding woods and hedgerows. If you see injury, think about border treatments, treating the edge crop trees (not the woods), rather than applying extra broadcast sprays to the entire orchard. Avaunt is a good choice for the first PC treatment, and covers Leps (like OFM and CM). If pyrethroids (Ambush/Pounce/Perm-up, Asana, Baythroid, Danitol, Mustang, Warrior) are used for PC, they should be used at the high rates. Actara and Belay are neonicotinoids that also work. A number of pre-mixes are on the market. See the production guide for efficacy ratings. A Note on Pre-Mixes: At this time of the season your primary pests are PC, OFM, Tarnished Plant Bug and Native Stink Bugs, and some BMSB as they start to move into the orchard. Avaunt is one of the best materials for PC and covers OFM, but is weak on tarnished plant bugs and stink bugs. The pyrethroids do work on tarnished plant bug and stink bugs. Some neonicotinoids also work well on PC and stink bugs (Actara and Belay). One combination material we recently discussed with a grower was Endigo®. This, like other pre-mixes is not a simple 1:1 addition of 2 other insecticides. Let’s look at the active ingredients (ai) and amounts in each product. This is just one example of what you might need to consider when using these products. Endigo is a combination of Lambda-cyhalothrin (Warrior or Warrior II), and Thiamethoxam (Actara). It has 9.8% ai lambda-Cy and 12.6% thiamethoxam with a maximum use rate in peaches of 6 oz/A. This is equivalent to .885 oz thiamethoxam and .66 oz lambda-cy. A full rate of Warrior II gives you .66 oz ai, and Warrior – .64 oz ai. or the same amount as the high rate of Endigo. But, a high rate of Actara alone (5.5 oz/A) is equal to 1.375 oz ai thiamethoxam per acre, while the Endigo only gives you 2/3 of that. If using Endigo, to get the full rate of each ai, you would need to add another 1/3 rate of Actara. This discussion does not include costs, but since you are trying to control multiple pests at this time, it is worth a thought. Bacterial Spot: Both Mycoshield and FireLine are registered to control Bacterial Spot on peaches and nectarines. The active ingredient (A.I.) in both materials is Oxytetracycline. In Mycoshield the oxytet is in the form of a calcium complex. In FireLine, it is in a hydrochloride salt form. In both cases the a.i. is the same percentage in the formulated product. Therefore the use rates will be the same for each product. The use rate should be calculated based on the dilute volume it takes to cover mature peach trees. In this case, the full rate should be 1.25 – 1.5 lb/A. The idea with using any antibiotic is to kill as many bacteria as possible just before an infection period. It is best not to assume a calendar schedule will be adequate. Treat just prior to significant rains. Neither coppers nor oxytetracycline will weather well. Recent research has shown that 60% of Mycoshield a.i. is gone after 1 warm sunny day. With cloudy and overcast days, 60% is gone after 2 days. Under heavy rains, 65% is gone after the first few minutes of a downpour. So during the times that the fruit is most susceptible to infection (now), Mycoshield or FireLine use may be justified for the first few sprays, as long as it is applied shortly before a rain. After a few weeks then move to the coppers, or use Mycoshield/FireLine just before a rain and coppers after a rain event. The main insect complex for late this week and early next week: Includes codling moth, plum curculio, and European apple sawfly (in northern counties). Aphids are starting to become visible, but should have already been treated in the delayed dormant period. Some orchards are experiencing early mite build-up. Codling Moth (CM): The first codling moth flight has started. The first adults were caught on May 5 in southern counties, and May 12 in Hunterdon County. Diamides (Altacor, Belt and Voliam premixes) should be applied at the end of this week in southern counties, and by the next weekend in northern counties. Delegate can be applied slightly later. Growers with high populations are especially advised to use these newer materials and not Imidan or Lannate. The 2nd complete spray timing for CM generally coincides with timings for TABM. Materials used for TABM should also be very effective for CM. Tufted Apple Budmoth (TABM): See peach section. Plum Curculio (PC): Plum curculio is a key pest during the petal fall and first cover sprays. Please see the peach section for a more complete discussion. Aphids (Spirea and Apple Aphids, and Rosy Apple Aphids): Use a conservative average of 1 colony/tree for a rosy aphid treatment level. Beneficials may be present. Unfurl curled leaves to see if aphids are either parasitized or have predators feeding on them. Parasitized aphids appear brown and swollen and may have exit holes in the abdomen. If predators are present, and All Colonies are either parasitized or have predators present, then treatments may not be needed; otherwise treat with a neonicotinoid insecticide or Closer, in enough volume to thoroughly wet the entire tree. Closer can be used at 1.5 oz/A (green and spirea aphid complex), but increased rates to 2.75 oz/A are better for rosy aphids. At the high rate of 5.75 oz/A, tarnished plant bugs are also controlled. Do Not Mix neonicotinoid insecticides and DMI fungicides (Rally, Procure, Topguard, Vintage, Indar) together if flowering weeds are present in the orchard. This mixture can be very toxic to bees. Apple Scab and Other Diseases: According to the NEWA models, about 90% of the overwintering ascospores are mature from southern counties up through most of Hunterdon County. Rains forecast for later this week will be the next scab infection periods, and should result in a large release of ascospores. If your orchards are still scab free by Memorial Day, then you will be able to rest easier and concentrate on summer diseases for the remainder of the season. Scab symptoms from earlier infections should become visible this week. Other diseases important at this time are powdery mildew, rusts, and black rot. Cranberry Weevil (CBW): We are finding the occasional CBW adult while scouting, however all locations sampled over the past week were under threshold. The maximum CBW per site was 1.3 adults per bush. Plum Curculio (PC): We continue to find PC adults over the past week in both Burlington and Atlantic counties. The maximum count per site was .4 PC adults per bush. There are no treatment options for PC during bloom. Leps. and other larvae: We are starting to see leaf roller larvae and other leps while sampling the fields. 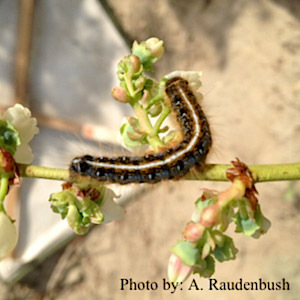 The maximum leaf roller larvae per field was 2 per 100 blossom clusters. In addition, in two fields in Atlantic county we found eastern tent caterpillars while sampling in the blueberry plants (Figure at right). These caterpillars have made their way into the blueberry fields from surrounding infested trees. Because these larvae are large and there are bees present, there is nothing you can do with them at this time. Thrips: We began finding thrips in the field in Atlantic and Burlington counties on May 6th. Most farms do not have thrips activity. The maximum number of thrips was 55 thrips per 100 blossom clusters. Since our sampling consists of 100 blossom clusters, the highest count of 55 thrips equals about .55 thrips per cluster. The treatment threshold is 1 thrips per flower cluster, so even this highest count is only 50% of a treatment level. Based on our “Thrips Activity Predictions” (http://benedick.rutgers.edu/Blueberryweather/ddcalc2.php), so far thrips have accumulated a total of 390.04 degree-days (see below). Based on our multi-year experiments, thrips require approx. 690 degree-days to reach 10% activity. At this point, the model indicates low thrips activity, which coincides with field observations, as indicated above. 10% emergence not expected in the next 6 days. Aphids: The first aphids were observed in the field on May 6th in Atlantic county at two sites. At each site a single aphid was found. The following table is intended as an aid for orchard scouting. It should not be used to time pesticide applications. Median dates for pest events and crop phenology are displayed. These dates are compiled from observations made over the past 5-10 years in Gloucester County. Events in northern New Jersey should occur 7-10 days later.